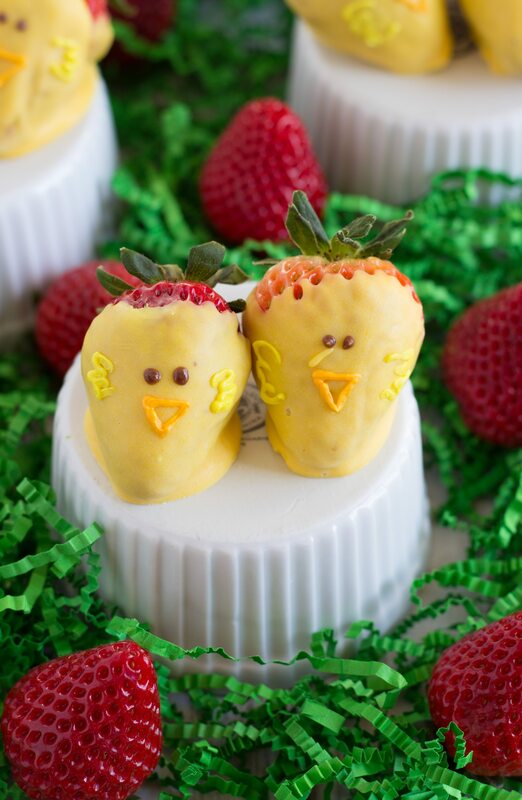 Chocolate covered strawberries decorated to look like little Easter chicks. 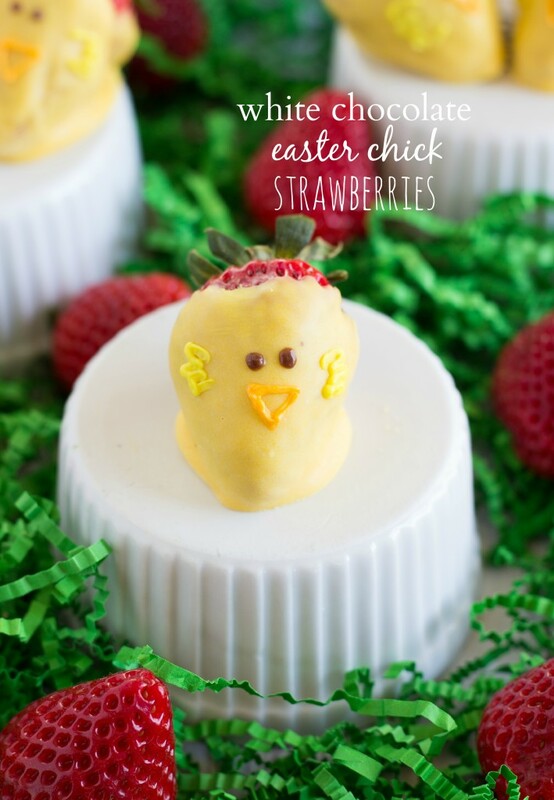 A simple and fun treat for Easter or Spring parties. Chocolate covered strawberries are one of my favorite treats. So basically anytime I can come up with an excuse to make them, I do. And in thinking about Easter, I’ve seen the carrot covered strawberries (so cute), but I couldn’t think of ever seeing any baby chick ones. So bam. Gotcha covered! Wash the strawberries and allow to dry completely. They won't dip well if they are at all wet. Since chocolate hardens so quickly, I like to work in several batches. In a microwave safe bowl place 1 cup of candy melts with 1/2 tablespoon vegetable oil in the microwave. Microwave for 30 seconds, stir, and microwave for another 25 seconds. Stir until melted or return to the microwave for a little longer. Add more vegetable oil if needed to thin so the strawberries can easily be coated. Place the dipped strawberries on prepared baking sheet and allow to completely dry. Place the chocolate frosting in a small bag. Snip off the very end and pipe little eyes onto each of the strawberries. Place 2 tablespoons of the cream cheese frosting with a few drops of yellow food coloring and mix until a yellow color is achieved. Place the dyed frosting in another small bag and snip off the very end. Pipe on wings for the chick. Dye the last tablespoon of cream cheese frosting orange. Place the orange frosting into a third small bag and cut off the very tip. Pipe on beaks. If you have frosting tips you can use three frosting bags with #2 tips to decorate these chicks. Whoa whoa whoa…this is SO MUCH CUTE to handle on a Monday morning…and I LOVE IT! These are so cute! I love chocolate covered strawberries, and I love this version! You are so sweet, thanks Kelly! Omg, Chelsea! These are so, so cute! Love that you made these out of strawberries. Usually I’m terrible at dipping things in chocoalte, haha, but I would so love to try these. Adorable! OMG these are the cutest little chicks ever!! My daughter will love them! Thanks Chelsea! These are so clever, and made out of fruit, amazing. Thanks for sharing! Holy cow, these are like, the cutest things EVER. Love! These are so cute, Chelsea! They will be the perfect festive Easter treat. Chelsea, what a fun giveaway.. and a cute way to decorate strawberries! So so cute!! I love chocolate covered strawberries but rarely make them for some reason. Which is silly because they are so simple. These are just perfect for Easter! Chelsea, these are too darn cute! I love chocolate strawberries as well and these are just the perfect way to make them. Pinned! OMG these are so stinking cute. I’m not sure I could eat them….Oh who am I kidding! What a great and cute recipe! These are so stinkin’ cute!! I think I may make some for my daughter’s Kindergarten Bunny Brunch. Thanks Cindy! I hope you enjoy them! What a sweet and yummy giveaway! 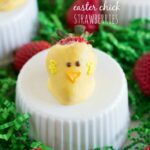 What a cool giveaway and a fun easter recipe! I’m not sure if I would have the patience required to do all that decorating work… I would want to dig in and eat them too much!